Small groups are the communities within our community. They are gatherings of 5-25 people who meet weekly in homes or other venues all throughout the city. Small groups serve as an ongoing discipleship setting where we intentionally intersect our faith with everyday life in the context of a loving and growing community. Each group varies in structure and content, having their own unique purpose for meeting. We will keep a list of small groups offered at Bethel on our website. Check often to see what is being offered. You can email us and let us know you are interested in one of our small groups. (Just because you let us know you are interested does not mean you are committing to it, but simply wanting more information about that group.) Once you email us you will be hearing back from that small group leader in a few days and they will give you more information about their group. Foundations Class which is a 2 week study. 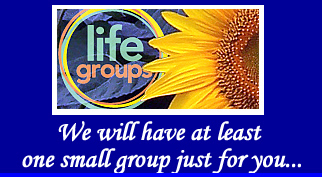 Please email us and let us know you are interested in one of our small groups.